If you’re new to using apps in the classroom, this is your chance to be guided through the scores of useful and essential apps for making the most of your iPadwith your students. Join one of these self-paced courses led professional development training for administrators and classroom teachers as they discuss productivity, creativity, and utility apps for educational use. 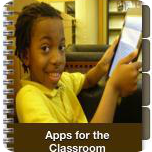 Paid and Free apps for the iPad will be discussed during these sessions. Apps for content areas will be featured in other courses.View the course offerings in itunes. Note that you need to have iTunes University app installed to access these courses.